Melon is the new black. It is not the new black I was hoping for as I stuck pins in my sweet-fruity-floral voodoo doll, but there you are: be careful what you wish for. If you like melon in your perfume, you are going to love Emotionnelle, the latest fragrance from Parfums DelRae, which opens with the biggest, brightest, juiciest melon (Octavian at 1000 Fragrances: "I've never seen such a huge and hyper realistic melon note...") ever bottled. You can just about taste it. Emotionnelle was reportedly inspired by the smells DelRae Roth recorded in her diary on a visit to Paris (why couldn't she have had jasmine and frankincense for breakfast? ), but perfumistas will more likely notice the links to Le Parfum de Thérèse, created by perfumer Edmond Roudnitska for his wife during the 1960s and released by Frederic Malle in 2000. Roudnitska's son, Michel Roudnitska, developed Emotionnelle, and as his DelRae Début might be seen as a modern take on his father's Diorissimo, so Emotionnelle could be the modern take on Thérèse. Le Parfum de Thérèse is a long time favorite of mine; I said when I reviewed it that it "would certainly make my list of desert island fragrances", were I forced to come up with such a list. And there is melon in Thérèse, to be sure, but in Thérèse it is an accent — it gives lift to the soft, spicy woody-leathery base — in Emotionnelle, it is front and center, from the first spray to the last gasp. There are other notes, to be sure (the list: tangerine, bergamot, violet leaves, jasmine, rose, plum, cedar, vetiver, carnation and amber) but I hardly notice them. Michel Roudnitska is brilliant, and this is no doubt a brilliant perfume (Denyse at Grain de Musc: "Great job, beautiful scent."). I just don't like melon (Patty at Perfume Posse: "Wow, melon hell. "; Tom at Perfume Smellin' Things, after smelling Emotionnelle on Patty: "I however ran from it and was glad that March, who is old and censorious friends with Patty asked her to please wash it off forthwith."). I spent some time yesterday trying to decide which I liked least, Emotionnelle or Hermès Un Jardin après la Mousson, and finally decided it wasn't worth figuring it out: they're different breakfasts, but they're both still breakfast. 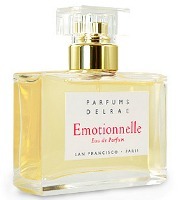 Parfums DelRae Emotionnelle is available in 50 ml Eau de Parfum. For buying information, see the listing for Parfums DelRae under Perfume Houses. 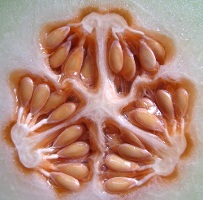 Note: image at top right is Melon seeds by Xerones at flickr; some rights reserved. Well, it may be splitting hairs (or breakfasts), but I still think I like Apres la Mousson the least. Yes, Emotionelle blares as much as Amoureuse from the same line, and yes, it blares “MELON!”, but it makes no attempt at aquatic freshness, and for this I will give it points. That is true. I'll give them both points so long as I don't have to wear them. Goodness, my mouth started to water when I saw the picture! I must be in an end-Winter funk. The melon note isn't a favorite of mine, but the drydown looks interesting. The rose/plum/vetiver/amber might be nice if I layer it with LA's Voleur de Roses. This is a beautifully created fragrance. Unfortunately, the main note of melons is just not appealing. I am sorry to say that I don't think this one will be as big a hit as her other fragrances have been. Let's hope for better with Mythique. Hope you'll love it! If that combo sounds nice but you don't end up loving it, do try Therese if you haven't already. I don't think it will be a general hit w/ perfumistas, but that isn't necessarily the kiss of death, right? I can see a scent like this appealing to the wider public. Would love to know how Mousson is selling, for that matter. Maybe everybody else on earth loves melon. No, it's not the kiss of death by any means, R. Like I said, it is beautifully crafted. It will sell, but I don't think it will be as big as say Amoureuse or BdP. R, I'd love to know which is their biggest seller! Once again, Robin, another way-cool picture. And another fab review. I'm waiting on samples for everything in this line available from luckyscent….can't wait to try them. Don't know yet how I feel about melon as a note, I know I'm not a huge fan of melons in general. But then I'm not a huge fan of grapefruits and yet I find I like most things that list a grapefruit in there somewhere. oh, my fickle nose! You know, I do have to say hats off to the accomplishment. It's the truest, most luscious melon I've ever smelled that didn't arrive on my plate draped in prosciutto. Having written that I have to say that I have as much desire to smell of this as I do of a two-minute egg or a biscuit smothered in gravy. There's Gourmand and then there's Grocery Store. Ah, and the melon maligning continues. Plum good. Melon bad. Screaming green good. Melon bad. Dirt good. Melon bad. Skank good. Melon bad. I'm ever-so-slightly. . .puzzled. . . I agree with Erin. Mousson gets extra negative-points for being all wet. (shudder.) You and I are going to have to find a new hobby. I want my lychee back, please. Well, it IS weird. An excellent question. I ponder it myself. I'll wear dirt, creosote or strong black tea. I'll wear leather or rubber. Other fruits don't bother me, so long as they're not overwhelmingly sweet. And I love to eat a good melon. So why is it so unappealing as a fragrance? I am not sure. Mousson I could argue I didn't like because it was also quite aquatic. This smells mostly just like melon. So why shouldn't I be thrilled? Melon is not “bad”, I just don't like melon. Whereas I do like screaming green, dirt and skank (within reason). I do try in general to review things that I don't like in an informational kind of way, so that hopefully someone who WOULD like it would recognize that, but I totally know that I did not accomplish that here, which accounts for the “sort of” in the title. I would like to know when the “melon memo” went out…it seems very odd to me that we've suddenly got this crop of them! Once again, very cool picture is thanks to all the fabulous people at flickr who take great pictures & then let others use them. I love flickr! Tom, I can't complain about grocery store, really. I love Demeter Condensed Milk, and Egg Nog. I don't mind an utterly realistic chocolate scent every so often (I probably wouldn't want that biscuit in gravy). I don't know where my aversion to melon comes from, but I suspect it's the general overuse of calone in perfumery that has turned me off to it in fragrance. I really think (for me) it's because it has become so cliched in perfumery — I think there is almost no way you could dress up a melon to make me love it. All you've got when you're done is a more artistic Cool Water, which just isn't something I want. But that doesn't totally explain it, because I found both this & Mousson nearly nauseating — wasn't just that I didn't like them, but that it actually bothered me to have to smell them. I wanted to wash.
And should have added that I like a little bit of melon — in Therese it's beautiful. Apparently the perfumers aren't reading the perfume blogs. Hope you'll love it then! And they needn't read the perfume blogs, right? I'm hardly anybody's target audience, and what I know about what will sell is very, very little. Me, too. I bet it's BdP, but my favorite is Amoureuse (partly because I just love that name!). Of course, Debut is great for the summertime, as you and I both know. I know exactly where my aversion to melon comes from: Cantaloupes and honeydew melons gave me stomach aches when I was a child. Talk about childhood experiences affecting one's adult life, lol! Maybe it's that phenomenon where you're aware of something — especially if you're not fond of it — and suddenly it seems it's showing up everywhere?? There's got to be a name for it: some kind of Irritation Repetition Sensitivity. Yeah — the IRS Syndrome! Nobody seemed to complain when a swack of vanilla scents hit the shelves recently, for instance. In fact, I'm sure somebody, somewhere in blogland wrote a whole feature on My Favourite Vanilles, and readers chimed in enthusiastically with lists of their own. Swack of incense scents?? Bring it ON, CdG. Did anyone whine about too many incenses? Not moi. Parfums de Rosine does roses, roses, and nothing but roses, and folks love 'em. But whoah, imagine if someone did a whole piece on his/her favourite. . .melon scents??!!! Or a company started a line called Parfums de Melone, with things like Ecume Melones and Melone Kashmiri. See, it would never happen; they'd be certain to face a volley of rotten canteloupes for their audacity. Um. Can you tell that I actually kinda dig melons? That I thoroughly envied Robin her unsniffed FB of Apres la Mousson? And that I thought that Vanille Gallante was (yawn) Not ANOTHER Vanilla?? Hey, but this has had several VERY favorable blog reviews already (I linked to 2 above). And somebody, somewhere, must complain about too many vanillas? Or too many incense scents? Aha, but there is NO such thing as too many incenses!!!!! I vote for a Lazy Thursday poll for fave melon scents! And we'll all wear orange. . .
Oh, I'd bet it works on many people! And true it is not meant to be a commercial fragrance, but I think you could sell it in mainstream stores with no problem: melon is a very popular note, and there's nothing esoteric about Emotionnelle. P.S. Didja hear the latest, R? Someone's got an Eau de Durian is in the works for the Asian market. Now, even I would concede, THAT'S some smelly melon! Yeah, I you're probably right because it is lighter and she added an EdP version a couple of years ago. BdP is probably the favorite among perfumistas. You (and March) are certainly not the only perfume blog mistresses/masters who are not thrilled with the recent melon craze. Many blog commenters (is that even a word?) also express dislike of melon in perfume. I think it would behoove the perfumers and perfume houses to 'listen' to the blogs, considering the number of bottles we perfumistas purchase. Okay, one or two melon scents every now and then, but…there are too many to mention here. Yes, but there's no reason to think that bloggers (or blog readers) are in any way representative of the perfume buying public as a whole, or even of the niche perfume buying public, right? And there's got to be some self-selection going on w/ the comments: those who agree w/ the gist of the post are more likely to comment. Really? How cool! I've never smelled durian. This made me smile. But in all seriousness, I can't explain any better than anyone else here why melon seems *bad*, I just know on an intuitive level that melon in perfumery is not good. Whereas melon as a food is perfectly enjoyable – I wish I had a big slice of cantaloupe or honeydew right now. Well, it's the melon equivalent of cumin or civet in a fragrance…. Veerrry musk-y. Possibly, but I prefer to believe that it is the 'intelligent' perfumistas that read and post on the blogs, whether 'we' agree or disagree with the gist of the article or not. Was it in the Sniffapalooza magazine interview where I read that melon was an after thought by perfumer, Michel Roudnitska, and was not included in DelRae's original idea for the Paris scent? Yes, would guess that's right. LOL — I'd prefer to think that too! And yes, we own WAY more bottles. There are plenty of other foods that strike me the same way. Strawberries, for instance. Good to eat, not so good in perfume. But obviously most of the world disagrees w/ me on the “not so good in perfume”. That's what I hear. Would like to smell one! Ah, is that right? I assumed it was on her “list” of things she smelled. If not, she really did give MR latitude to do as he liked, since the melon seems to be the point. To me, anyway. oh i am laughing over your friend's experience! and after all the focus on melons it seems a little off topic, but i just have to say i love the bottle they have created for this line. to me it looks so luxurious but not at all froufrou, and feels perfect in the hand. easy to spray, too. When I was younger I had a lotion made by the original Body Shop in Berkeley that was Honeydew. It was insanely good, it smelled just like ripe honeydew, with none of that watery calone smell so prevalent in these perfume melons. I wonder if maybe cantaloupe and watermelon are just the wrong melons to emulate in perfume? I finally had the chance to try one a few years ago and surprisingly, I liked it! It's an odd smell, very musky for sure, but it didn't taste as strong as it smelled! I don't think I've ever tried Therese, must give it a try thanks for the suggestion! Ok, so I was the girl who gave Emotionnelle a good review, along with Octavian of 1000fragrances. So: is this cultural? Is this a “convention” amongst perfumistas? Melon = bad? Please feel free to contradict me! I can only speak for myself here but I am North American. Personally, I love the smell of melons. I eat some type of melon for breakfast at least once a week if not more often. It is also a component of salads I serve my family, especially in spring and summer. However, while it may make a nice air freshner or a nice spritz on the sheets once in a while, it is not a scent that I would readily associate with perfume. This is not just for melons but for most berry or fruity perfumes also. It's backlash really, It seems lately every perfume house is putting out nothing but fruity tooty scents. It's become boring and tiresome. It also has to do with my age I think. When I was in my teens, fruity smelling perfumes like Love's Baby Soft and chapsticks like Bonne Bell were very popular as a “teenage scents”. They were and are very “fresh” smelling …like room freshener. However, as a grown woman in my early forty's it's not appealing to me at all. I want something more sophisticated. That's all. I am glad you like it – to each their own – and that's what it's all about – Enjoy! I'm interested in the idea that a distaste for a melon note could be cultural but I just wanted to say that although I'm certainly not a fan of the calone melon I wouldn't say it was bad. Just that I didn't find it pleasing in a fragrance. I'm intrigued to try this one as from what I have read it isn't a calone melon and so could prove to be the test for me. (I like Parfum de Therese but prefer Diorella) – oh, and I'm English which I guess puts me in the middle of the cultural divide! sigh….I had to go answer the door…and lost my train of thought…darn it….thinking is such an inconvenience prior to coffee…. Then I guess it is all the more fitting that DelRae and Roudnitski added a melon note to their scent in remembering Paris. My sample is on it's way, so soon I will be able to judge for myself if I like it. I am American and do not revile melon in perfume. I rather enjoy Un Jardin après la Mousson. Hey, be careful…..I'm buying you that for your birthday, LOL! Seriously, I can't wait to try this next time I'm at Barneys – I'm not a huge melon fan but I don't HATEHATEHATE it like some (March)people do so I can be a bit more objective. I will offer myself as a guinea pig and try that against the Hermes. If I don't come back from this at least you know I did it for Perfumistas everywhere! Don't forget “Beaucoup des Melones” and “Melones Pour Moi” and the surefire hit “Tout le Monde Melones” ….Robin I believe is retching by now, sorry dear. Never try carrying a cut Durian melon home on public transit in any North American city! I was on the bus with one, and the lady beside me actually got up and moved about ten rows back! P.S. It was a joke about the Durian fragrance, by the way. Although come to think. . .
Melones Extreme. Melones eau Fraiche. Melones en Primeur! . . .and, how could I forget? Melones Noir. LOL — don't say we didn't warn you. I like the bottle too. Not the cap though. it is clear that you and I both had our coffee today! Carmencanada, Emotionnelle seems to have been mostly dissed at MUA…would be interesting to see where all those people were from. I really have no idea if it's cultural or something else. Whereas for me, melon as food is -in most cases- not good, and in perfume… meh. I have no strong feelings about it either way. My perfume mania is too short-lived and I am possibly too young to have suffered the melon-aquatic craze of the 90s, so my palette has not been spoiled. I regard melon in perfume as I regard most fruits in perfume: with slightly bored distaste. Mmmmmm….raspberries……but they don't work in fragrances for me either. With both raspberries and cherries the smell reminds me too much of the cough syrup I was given as a kid. accck cherries! when I was a little kid I had eaten something cherry flavored (don't recall what, it was 2 million years ago) and later started vomitting like crazy…..so I'll let you guess what cherries reminds me of…. I'd say, if Michel Roudnitska and Jean-Claude Ellena both like melon, we melon lovers are in pretty good company. P.S. For cultural reference, I'm Canadian, with a lot of French in my background, and I missed the whole calone thing in the nineties. Perhaps that's part of why, for me, melon good. LOL at the cat hiding under the bed! I have a cat that tries to lick my arm if I'm wearing a perfume she likes, and she turns up her dainty little nose at those she doesn't like. Hey, Robin, how about a lazy Friday name-your-pet's-favorite-fume poll? Robin, I'm mostly intrigued by the near-unanimity of the melon aversion. It's not only because it's a fruit: pears, peaches, strawberries or raspberries don't seem to generate as much rejection, though red fruit is almost ubiquitous nowadays (yes, Insolence, I'm looking at you). Hi, carmencanada — I agree with you, I'm a little mystified by all the melon-hate going on, and do think that part of it is driven by the Calone overdose of the 90s. Because the melon-descriptor is so often attached to Calone-heavy compositions, I think a lot of perfume connoisseurs have come to eschew any melon at all. A sort of “guilty by association with Calone”! Me, personally, I find the Roudnitska-melon to be very different from the melon-facet of Calone (as you say, one facet out of many that this over-used synthetic contains). Octavian wrote an interesting post on the Roudnitska melon note, including what sorts of aromachemicals would go into it(http://1000fragrances.blogspot.com/2007/09/melon-note-of-roudnitska.html). Of course it shows no sign of Calone! I think third source of “melon-experience” is “melon”-flavoured candies, for example, melon-flavoured Japanese gummy candies (yum). These tend to be “larger-than-life” melon flavours/fragrances, and ones that I don't mind eating, but might not want in my perfume. (As an aside, since melons are part of the cucumber family, it's interesting to think about whether “cucumber” notes elicit the same revulsion as “melon” notes among perfumistas). Oh yes, and French melons DO have a different/taste fragrance. Cavaillon melons are the most delicious, fragrant canteloupes in the world! Our run-of-the-mill supermarket cantaloupes in the US (actually a muskmelon, and not a “true” cantaloupe) are pallid, watery things in comparison. Well, to be fair, Emotionnelle isn't all about fruit: it's got a wonderful jasmine-amber accord in there, so I wouldn't qualify it as a mainstream “frooty” — which I agree are ubiquitous and tiresome. And I do remember Love's Baby Soft, though as a clean powdery musk — but I know what you mean. Mine was Max Factor Green Apple! (in fact, it's still around: my mother never chucked it…). Ah, but red fruit is NOT ubiquitous in niche. If JC Ellena's next Hermessence is based on strawberry, and then shortly thereafter we see new strawberry perfumes from Annick Goutal and Serge Lutens, you'll hear more kvetching around here! In other words, part of my complaint is that all my favorite niche brands are suddenly doing melon and/or aquatics. That said, I've like several berry-ish fragrances recently (Byredo Pulp, TDC Sublime Balkiss, etc) and perhaps JCE could do something with strawberry that would actually please me. And I must say that I've gotten a happy little gift in following this thread — beyond all the great posts and general good humour — because of Robin's timely mention of Grain de Musc. How could I have missed this wonderful site? I am now a grateful and avid new fan. LOL you're killing me….how about : Eau de Melones Verte, Bois de Melones, Un Jardin de Melones Apres le Match de Football, Ceci N'est pas Une Melone, and for the movie lovers amongst us: Melons on a Plane !!!! Now you see this is very intriguing to me that you mention Insolence. I did not like Insolence Edt at all – over the top fruity fluff but I loved Insolence EdP – powerful, probably too powerful but a huge WOW factor and it just smells so good because it has a lot more than just fruit going on and none of the dreaded cotton candy. And now it's gone here in the USA and I think its gone because maybe they are catching onto the backlash in regards to the fruity perfumes. And it's a shame because in my opinion, finally someone did a fruity perfume RIGHT! I have not tried Emotionelle yet but if its a well balanced, well done fragrance then I may try it. This is why this blog is so great, you get to hear the views of so many diverse people. I love it! It's worse somehow than civet or cumin… maybe raw, unadulterated civet. Are they really coming out with that as a fragrance or is it a joke? I only had durian juice once at an Indonesian place in SF — it smells vaguely of raw sewage but is also EXTREMELY sweet. That being said, I would consume it again. Also, for whatever it's worth, I like Mousson quite a bit, and I didn't get a bit of melon in Vanille Galante, the way you did, Robin. This reminds me of the Guerlain classics–it’s seasonless, but I’ll lean a bit more towards summer since it smells like melon with the scent of old money and hidden scandal. I picture someone with mega glamour wearing it. It’s definitely going on my purchase at some point, list! Tested this one today. It smelled nice in the vial – fruity for sure, but in a sort of cantaloupe-for-breakfast, with-flowers-just-outside-the-open-window sort of way. Then I put it on skin. Although I am not as opposed to the idea of melon as a lot of perfume fans (probably because I missed that whole early-90’s calone overload, lucky me), I didn’t like the melon note here. It smells extremely overripe – garbagey, even – as opposed to the happy, juicy scent I was expecting. After an hour, the decaying, flyblown melon wafts off and the rest of it is rather pleasant. The progression goes from Rotting to Eventually Inoffensive but Unmemorable. A big “NO” on my test notes.